Alfresco dining is something we all look forward to when summer rolls around. If you have a concrete patio you’re not sure what to do with, why not turn it into a stylish dining area? There are endless opportunities for you to enjoy your outdoor space, such as hosting dinner parties for friends, barbequing food for your family, and enjoying a quiet coffee in the mornings. We could all use a little more sunshine in our lives, so here are five tips to help you turn your patio into an alfresco hotspot. If you’re going to be entertaining guests in the evenings, you’ll need some outdoor lighting. Candles in mason jars look cute, but they won’t cut it when people are trying to eat in the dark. Luckily, with alfresco dining on the rise, there are endless options for garden lighting – including string lights, overhead pendants and even chandeliers. The contemporary FLOS lighting collection from YLighting features beautiful Italian craftsmanship, with their selection of light fixtures experimenting with bold shapes and iconic designs. There are so many outdoor dining tables available from home and garden stores that you won’t be short of options. However, it is possible to make a stylish, weatherproof table out of industrial concrete that’s sure to make a statement on your patio without costing you a fortune. Whether you choose to embark on your own DIY project or buy your table from a store, make sure you choose a durable material that can withstand the elements such as concrete, teak or synthetic resin. It’s easy to build a barbeque using bricks and concrete, and it only takes a couple of days to complete. 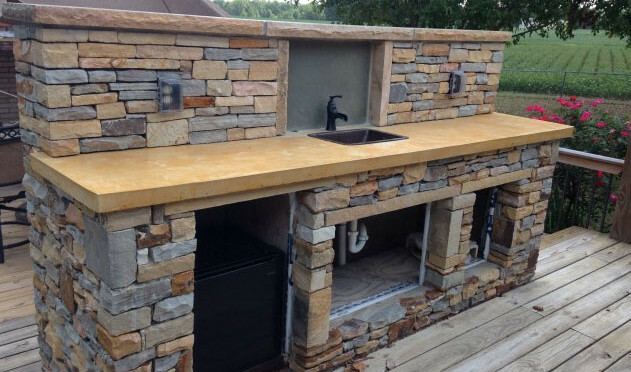 If you want to get really creative, you could also try building a stone pizza oven – just be sure to attempt these projects with caution, and ask for help if you don’t have at least some DIY experience. You never know when your outdoor dinner party could become a washout. What’s more, if you live in a warm climate, you may find that the sun is too strong for you to sit outside without shade during summer. Either way, it makes sense to add shelter to your dining arrangement, whether it’s in the form of a large umbrella, a conservatory roof or awning. Choose your patio cover carefully – while functionality is important, you also need to keep in mind that the shelter you choose will define the entire look of your patio. Depending on where you live and the time of year, it can get too chilly to eat outside when the sun drops. To keep you and your guests comfortable, be sure to invest in some outdoor heating. You can build a concrete fire pit relatively easily, which will give your patio a gorgeous, rustic look, or you can purchase some electric heaters. It’s also nice to provide blankets to encourage a cozy atmosphere that will help your guests feel more at home.